I thought Whale Sharks were mythological creatures, a bit like pink flying unicorns or the Lochness Monster… but they actually exist, they are not pink and they do not fly. 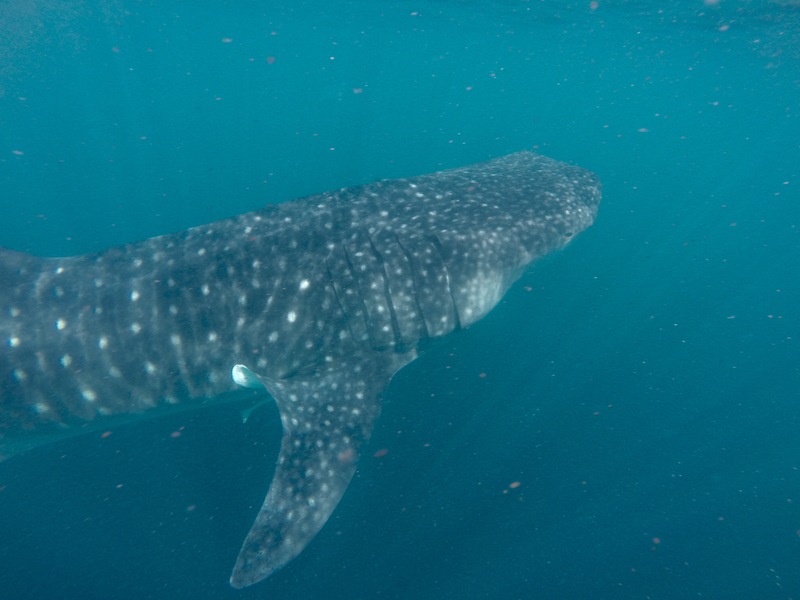 My long awaited encounter with a Whale Shark has finally happened after searching for almost 6 years. I had always missed them for one reason or the other, mostly because I was enjoying swimming with my favorite animals (one of my favorite to be honest) Manta Rays while the Whale Shark were wondering elsewhere and partly because they had been rare encounters in Baa in the past few years. But last week, finally the magic has happened, Maura and I got a call from a dear friend, we rushed over on a boat, and luckily the Gentle Giant was still hanging around feeding. This beauty was around 6 meters long and it took all the strength we had to keep up with him while he gracefully and effortlessly swam around. When you see his tail slowly moving, you think you can stay right next to him, then you find yourself short of breath despite the hundreds of hours spent snorkelling in the past years. He was surface feeding on his favorite food, a soup of plankton so we could see him continuously gulping water with his big mouth…It was a magical moment. The spots between the gills of a whale shark are like fingerprints for us and the Maldives Whale Shark Research Program that keeps track of where they are, informed us that this ‘little guy’ named Luke was first seen in May 2013 in South Ari Atoll. Thanks for coming around to say hi to us, Luke. Thanks for making my dream come true! Let’s hope for many more lucky encounters!